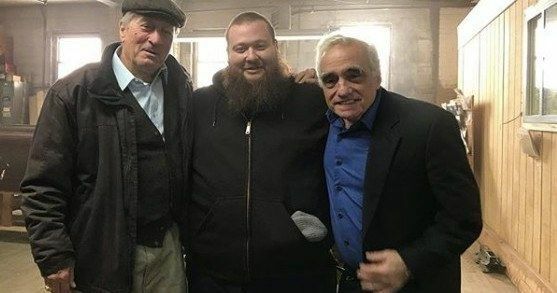 Action Bronson, aka Arian Asllani, has officially joined the cast of Martin Scorsese's upcoming movie, The Irishman. Bronson posted a picture of himself standing with Robert De Niro and Scorsese, leading to speculation that he was a part of the cast, which has now proven to be true. Billboard reports that Action Bronson will star in the movie alongside De Niro, Joe Pesci, and Al Pacino in an unknown role. The New York rapper and Vice TV star has yet to comment any further on his involvement in the Netflix project. Action Bronson took to Instagram to post a picture of himself alongside Martin Scorsese and Robert De Niro with a simple caption that reads, "religious art." Billboard first picked up the story that the rapper has a role in The Irishman, but no further information has been released at the time of this writing. Bronson also has a starring role in the Workaholics comedy movie, Game Over, Man!, which is also a production for Netflix. This will arguably be Action Bronson's biggest role to date and he looks more than a little excited in the photo. Martin Scorsese's The Irishman is based off of the book I Hear You Paint Fences by Charles Brandt. The story follows Frank "The Irishman" Sheeran, who was a hitman for the mob, leading law enforcement to the reported final resting place of Jimmy Hoffa. Robert De Niro stars as Sheeran while Al Pacino portrays Jimmy Hoffa and Joe Pesci plays Russell Bufalino. Scorsese has been attached to the project since 2014 and the movie has been in various stages of development since then. Action Bronson's career has taken off considerably over the last handful of years with successful rap mixtapes and albums along with starring on Viceland. Before getting into his rap career, which he considered to be a hobby at the time, Bronson was a majorly successful fire-flame gourmet chef in New York City and hosted his own online cooking show. However, Bronson fell and broke his leg in a kitchen accident which led him to make the decision to go into rapping fulltime, which he has done ever since along with more TV work and more recently, movies. The Irishman was rumored to have a theatrical run first, to qualify for awards season, but that has yet to be confirmed by Martin Scorsese or Netflix at this time. For now, we know that the movie will come out sometime in 2019 and probably towards the beginning of the year. There has been a lot of debate about whether a movie should be shown in theaters to qualify for the Golden Globes and the Academy Awards, which could see the movie in some sort of limbo. Sources close to the project say that it will have a 2-week theatrical run, but as previously noted, that has yet to be confirmed. While we wait for confirmation, check out the new picture from the set of The Irishman below, from Action Bronson's Instagram account.